Today one of our reader "Elvin" has asked me regarding some virus infected his Pc or some windows bug, which has caused his Task Manager in not displaying Menu bar and Missing Tabs. 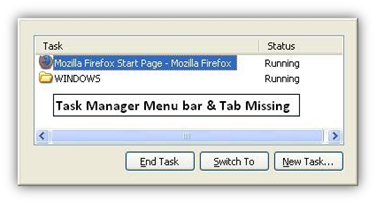 Normally, Task Manager has a menu bar which contains File, Option, View, Shut Down & Help and different tabs like Applications, Process, Performance, Networking & Users. 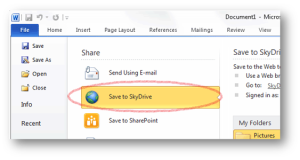 This can become very annoying since you can’t close Task Manager using the close button nor you can’t go into other tabs, however, keyboard access can be used to do the same. Basically, This is not any virus or bug, but it’s a feature of the Task Manager which runs in compact mode. In Compact Mode, the menu bar and tabs are hidden. The status bar becomes hidden and also system menu bar, which contains minimizes, Maximize and Close buttons are hidden too. One think, which comes in every people mind is that, how could this compact mode can be a feature of the Task Managers, what’s the use of compact mode? This can be useful for people how need to see only a specific tab screen, or want to hide all other options of the Task Manager from other people. To bring the Task Manager to normal mode. 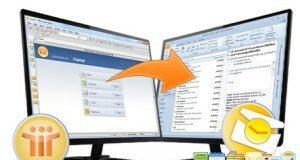 You simply need to double-click on empty area/space around the border of the Task Manager. Click on empty space which I’ve highlighted with light green color around the border. 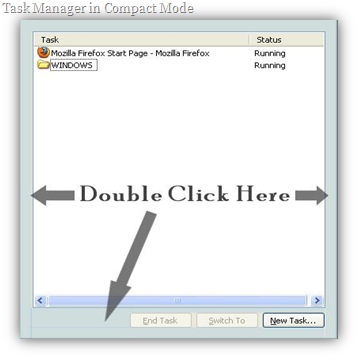 If you found compact mode interesting & useful, then double-click on the empty space around the border of the Task Manager to switch from normal mode to compact mode. Thanks for this….This is really helpful. 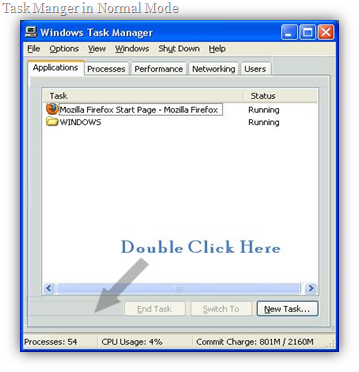 Beginners also should have or should know about the task Manager menu. Very handy advice for beginners. Something so simple can appear to be so difficult for the uninitiated. This is simply a great resource i have found. Thanks for the great source. I have bookmarked blog for furhter refrence. Thats good trick thanks for sharing..
Oh! Nice info, this is new to me.. I have an idea now if ever I will encounter those problem.